Digital camera is a common gadget that we use nowadays. Some of us may snap a lot of photos without the knowledge what is the best way of snapping them. Thus, it may result the quality of the photo is not up to its proper standard. 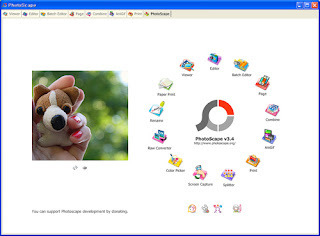 Now, instead of using complicated and payable software like Photoshop, we can edit those photos with this free but user friendly software called "Photoscape". What can Photoscape do for you? Later, i will try to post some tutorials on how to utilise Photoscape. Till then, just wait and please click our sponsor. Salah satu program free yang best dan banyak fungsi.